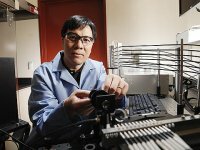 Congratulations to Dr. Chongxuan Liu, Pacific Northwest National Laboratory, on being selected as a Geological Society of America Fellow. This professional society, which boasts more than 24,000 members in 97 countries, honors those who have made significant contributions to earth sciences. Liu was chosen for his outstanding contributions in microscopic reactive transport in porous media and applying geosciences in understanding and solving environmental problems. In Liu's case, the environmental challenge is the movement and fate of radionuclides and contaminants in groundwater. Liu's research focuses on understanding and modeling the interactions of uranium and other contaminants in groundwater with surrounding subsurface environs. The research is part of the Subsurface Science Focus Area at PNNL and part of Integrated Field Research Challenge for the Hanford 300 Area. A strong contributor to the geosciences community, Liu frequently publishes in popular peer-reviewed journals. These journals include Environmental Science & Technology, Water Resources Research, and Geochimica et Cosmochimica Acta. He also serves on editorial boards for two journals and is editing a special issue on modeling and simulating bioreactors.